The new and buffed Royal Giant is amazing! Even though I usually don’t go with slow and expensive troops in my decks, I decided to make an exception for the royal giant after the recent buffs to it, and I am really glad I did. In April the damage and health was buffed a lot, and in the May patch the range was increased by 1, which is huge! 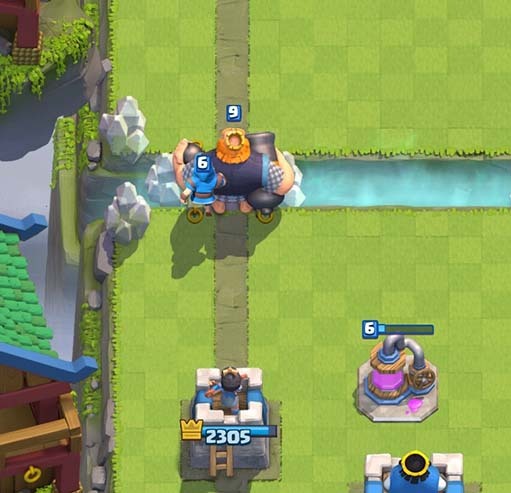 Now the royal giant can stand by the bridge and hit the enemy towers. May 18. there will be a patch that decreases the damage the royal giant does by 4%, but that is so little that it doesn’t really matter. Anyways, there are lots of royal giant decks out there, so I had to spend a lot of time figuring out which one would work best for me. 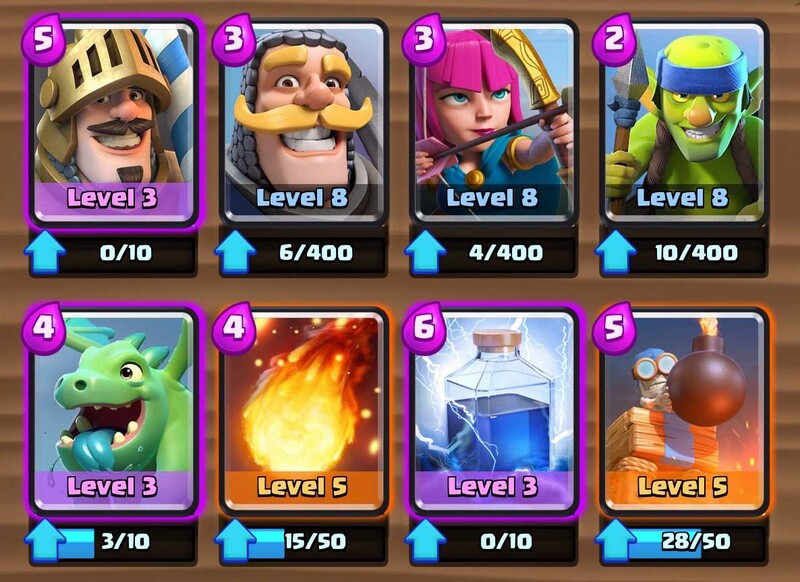 There doesn’t really seem to be a consensus on what troops are best to include in royal giant decks, if you look at the top 200 players they use a lot of different options, so this is my take on it. At the moment I use this royal giant deck as well as another arena 8 deck that I have a lot of success with as well. 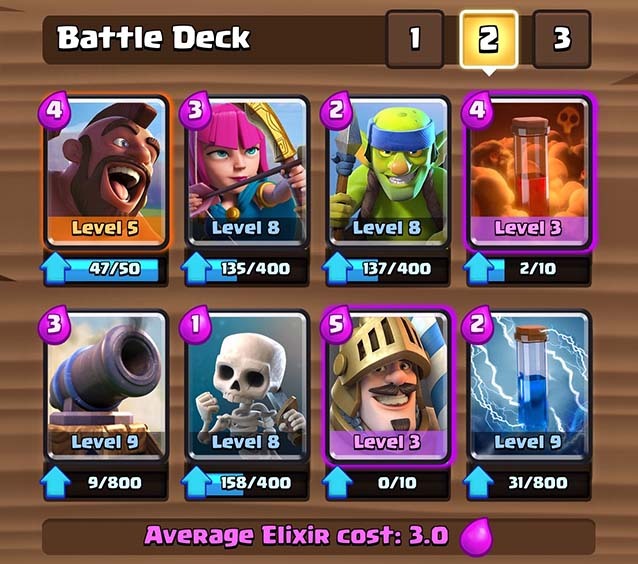 This deck is more expensive than most of my decks at 4.0 elixir, but that is not too bad for an elixir collector deck at all. The only level 7 card we use is the Royale giant, and there is only 1 epic card and no legendaries. That makes this a deck that a lot of players are able to make without any modifications. Obviously the most important card in the deck. It is a royal giant deck after all. It is also quite important to have it at a high level, I suggest you don’t try the deck out until you get him to level 8 at least. Minions are are nice and cheap counter to flying troops, they also do a lot of damage if you get them to the enemy towers. In most cases they won’t get to the enemy towers, but every now and then the royal giant or barbarians will tank for and let the minions get to the enemy towers unharmed. Spear goblins are in this deck as in most of my decks. It’s hard to beat the damage they do to both air and ground for only two elixir. They are also very important in distracting incoming troops while your barbarians or the wizard kills them. The one second stun is a live saver in many situations, you can also use this combined with poison to take out musketeers, barbarians and other annoying troops. These are your damage dealers. They will take out whatever ground troops your opponent try to kill your royal giant with. I like to drop them in front of the royal giant as soon as it reaches the bridge if I believe my opponent will counter with ground troops. If I believe my opponent will counter my royal giant with flying troops I will have my wizard ready. Putting him behind the royal giant as soon as it reaches the bridge works really well, he will burn through minions and other swarm troops with ease. The elixir collector is the best card in Clash Royale according to data collected on the decks the top players in the world are using. I believe the elixir collector is an important part in any deck that has elixir cost of 4 and above, and it works really well in lots of lower cost decks as well. Be careful with the timing for when you place it though, you don’t want to sacrifice a lot of tower hp for some elixir. This deck doesn’t use arrows, so a fireball is really needed then. You use this to take out minion horde, goblin barrel and other annoying cards. Both Arrows and Zap work as replacements, but Fireball is much better. Most often you will use this on incoming Barbarians, preferably with other troops mixed in there as well. Poison is a real good spell to both slow down enemy troops attack speed and deal a lot of damage to them. If my opponent has a lot of swarm troops or spawners I will use poison a lot to counter this. Fireball and Arrows are also good options in this spot. Here are my suggestions for card replacements. Minions can be replaced by archers. Zap can be replaced by arrows. Poison can be replaced by arrows or fireball. Wizard can be replaced by ice wizard. Spear goblins can be replaced by goblins, skeletons or archers. This deck takes some time to learn, but it is a lot of fun. Unlike the other decks I have posted here, playing this deck you preferably want to start out slow and get your elixir going before you attack. I like to cycle through and play defence until I get an elixir collector down. I prefer to place the elixir collector in the area in front of my king tower. This way it will distract any incoming hog riders which are still very common. 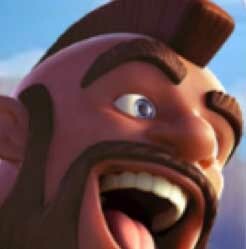 Barbarians also work great at killing incoming hog riders and they will then walk over to your opponents side where he has to waste elixir defending them. I really like to counter-attack after I have successfully defended with troops that survived at full or high health. That would preferably be the wizard or the barbarians. They move fairly slow so you will be able to build up elixir while they move over to the bridge. 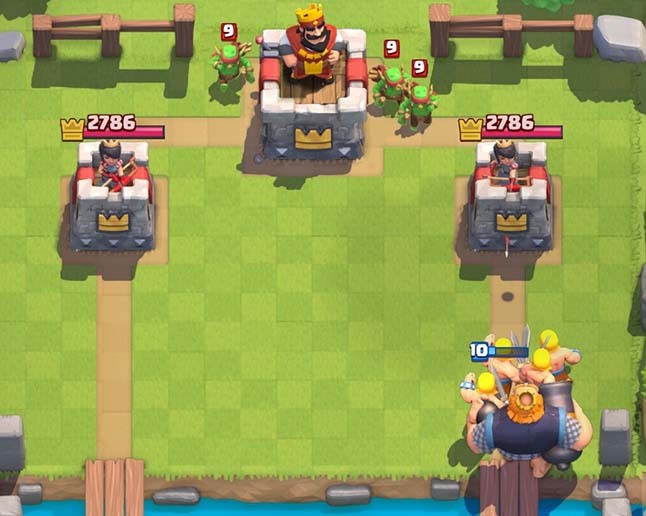 When the barbarians reach the bridge you place the royal giant behind them, so that the barbarians will take damage and fight defending troops while your royal giant is shooting at the tower. The goal is to keep the royal giant firing as long as possible, that is why you don’t want him to tank for the barbarians. The barbarians are by themselves good tanks and take out defending troops fast. 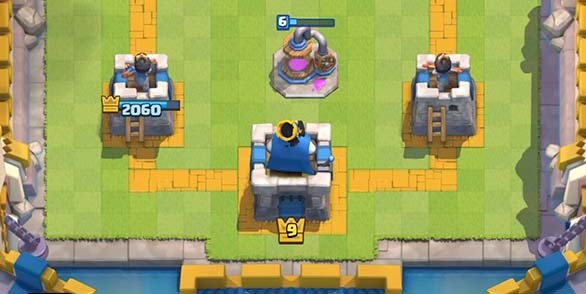 If you got a wizard walking towards the bridge, you want to place your royal giant in front of it. The wizard will die quickly, but if it is hiding behind your giant it will be able to deal a lot of damage to any troops your opponent sends at hit. This doesn’t always workout however, as the wizard will move past the royal giant if he is firing, but if you got the royal giant shooting at the tower at while he is a full health, you are already doing well. 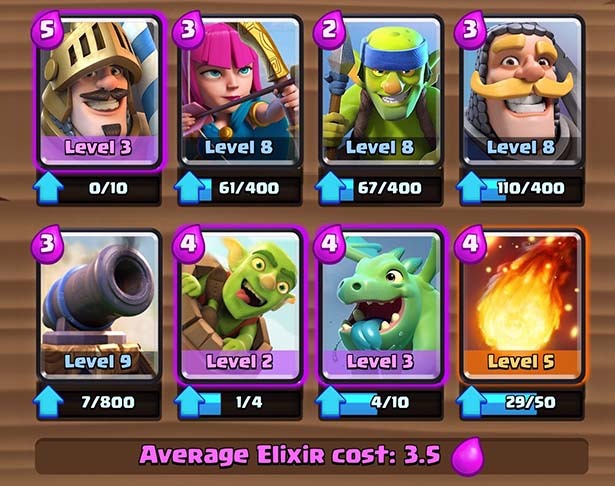 Once you have your royal giant shooting at the tower with either the barbarians or the wizard backing him up I like to play minions or spear goblins to deal even more damage, in some cases poison is also a good option. If you have already taken down one of the enemy towers during the midgame you should be really defensive and keep your towers alive. You can easily do this by playing your elixir collectors as distractions and using barbarians, spear goblins and the wizard to kill incoming troops. If will usually be a mistake to play the royal giant on defence, as it is so expensive, but it can be done if you run out of other options. If you are behind you need to be really aggressive during the endgame. Sacrificing damage to your king tower in exchange for taking down a crown tower will often be a good option. I will also often play elixir collectors in the back while I’m behind to make sure they are not killed. Then I will use this extra elixir for some strong albeit desperate pushes near the end of the game, usually including both barbarians, minions and the royal giant. The royal giant is a really strong card, but it takes a while to learn how to play well with him. Please don’t play 5 matches and give up. I had several losses in a row the first time I started using the royal giant, but after I figured out how to use him it turned around. Now this is one of my favourite decks and I have had a lot of wins with this deck at legendary arena. If you take the time to learn the deck however, please let me know how it goes. I am no expert with the royal giant yet, so I am also interested in hearing about changes I can make to the deck to make it even better. Good luck! This deck is total garbage I went down a whole arena using it. So I’ve been wrecking them with this deck!! I was skeptical with the 4.4 elixir if using the fireball instead of zap… but man that fireball is handy! Especially agenst the three 3 musketeers. You hit them with that fireball and they won’t drop them again. Lol. So I know it has nothing to do with gameplay but I got a legendary chest after one win and an epic after the next! I’ve only bought legendary chests. Never won one. So thanks. It’s 4.4 with fireball and 4.1 with zap. I’ve never used such a high count before. Idk if this is wise even with elixir collector. And loosing more than 5 games ?!? I get his to play Rg. I guess I could modify it a bit. Thanks. That’s a good idea, the cannon is a very good way to deal with hog riders. Replacing minions with cannon and keeping the spear goblins is another option, might be better I’m not sure.